Above: NYC Chapter Director Michael Anderson, providing coaching and guidance to Achilles Athlete Eleanor Chapman. A few weeks ago, a new Achilles member asked a brilliant question which was particularly appropriate at the start of a New Year: “Do you have some tips for a beginner?” Well, yes! Let me share my response. First, please understand that you are joining us to run but also to become part of our family and enjoy our sport. There is a very large range of abilities represented... from world class runners to folks who can ambulate several blocks. There are handcycle athletes who can move at forty miles an hour and others who complete a mile in an hour. There are folks out to enjoy a walk and others preparing for the Paralympics. As you progress, think of working out two or three times a week and keeping track of successes. Did I cover a greater distance? Did I go faster? Make sure to meet other members and our volunteers. This is a social sport. As the workouts become routine, consider participating in your first race. It should be a short one and an event in which other Achilles members compete. You have a goal! Many of our members run marathons - a 26.2-mile distance. For beginners, it’s a goal that may be a year away and many shorter races in-between. Eleven months after being introduced to the sport, I completed my first five-mile race. It was one of my favorite experiences. Not knowing too much about the sport, it was necessary to walk a bit near the end. I worried, would I be disqualified for walking? It was only after my first 13.1 mile half marathon that I even considered doing a full marathon? Subsequently, the word and goal became a very big part of my life. Having a goal is a great motivator. Another great motivator is the group, or “Micro-Community”. In my book, “The Courage to Go Forward” co-written with David Cordani, CEO of Cigna, the question was: “How could our thousands of athletes accomplish what many would consider the impossible?” The answer is, the group, or “Micro-Community”. Becoming a member and adopting its norms is perhaps the greatest motivator. Finally, one more aspect of Achilles is Mainstreaming. We talk about this often and it is essential to our success. 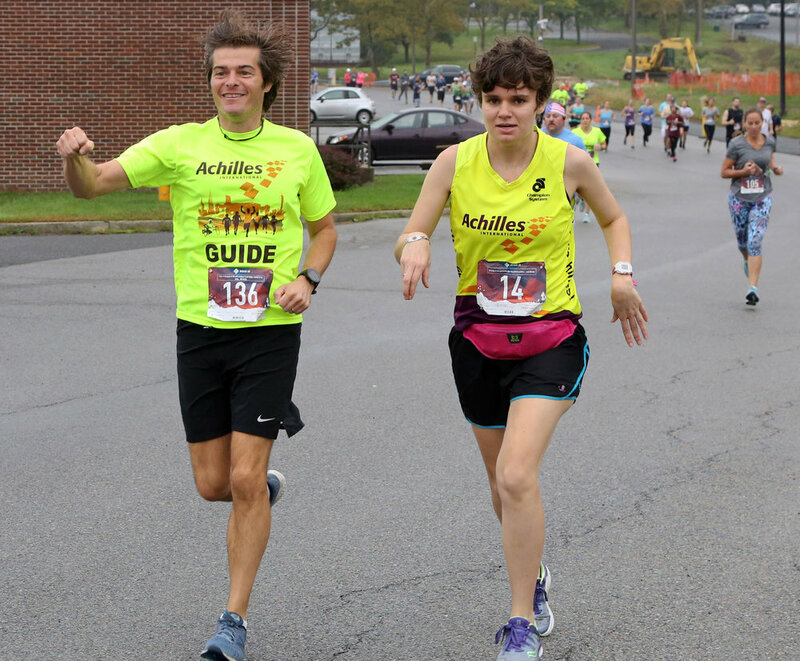 “Mainstreaming” means that Achilles members compete in races with able-bodied athletes. It has two very important consequences. Mainstreaming reduces the social distance. In addition, it illustrates that someone with a disability isn’t necessarily frail. It helps change lives and perceptions. It helps bring things “into everyday conversation”. This is something we are particularly proud of and have helped lead the way! We continue this goal – this mission – as we head into another year. Thank you all for your help in our success! Thanks to the Cigna Foundation, Achilles had the honor and joy of participating in the Walt Disney World Marathon Week, presented by Cigna. 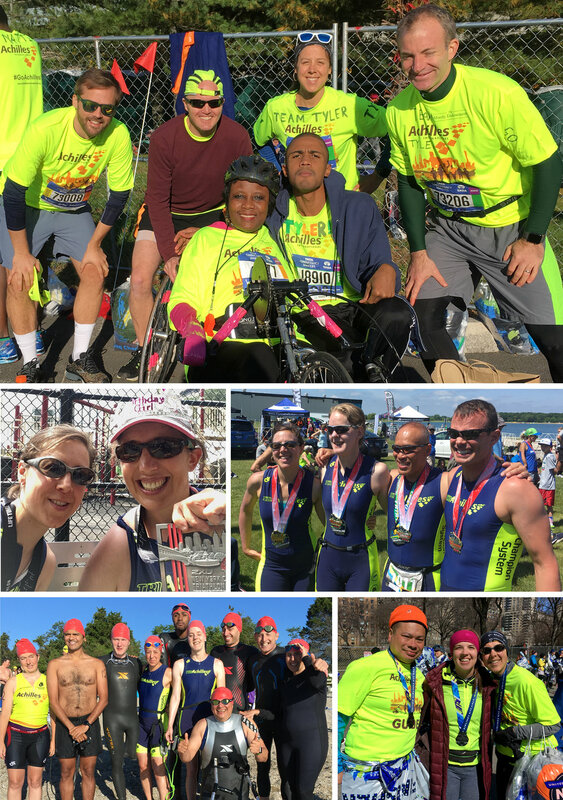 Athletes represented Achilles from our Cigna-Achilles customer referral program, the Freedom Team, Achilles Phoenix and Achilles NYC. Most of the team took on the Half Marathon which travels through Disney’s Magic Kingdom and Epcot. Everyone did well and some reached personal bests – thanks to their incredible guides from Cigna. Cigna CEO David Cordani ran as a guide for Freedom Team member Stefan LeRoy in the half marathon for the fourth year in a row! We are extremely grateful to David’s guidance and constant support of Achilles and the athletes we serve. Also of note, Freedom Team members Stefan LeRoy and Jarrid Collins tackled the Dopey Challenge – this is four races (5K, 10K, Half, Full), four days in a row. More like four nights in a row – with wake-up times starting at 2:30am! And Freedom Team Member Rick Weisbrod attacked that 5K, his first race running on his running blade since becoming an amputee - and he well exceeded his projected finish time! Well done, gentlemen! In addition to the races, it was wonderful to bring some Freedom Team alumni back into the fold who now have children of their own. We are all growing up together in a sense – at every stage – and that is a beautiful thing! The bonding that takes place during these weekends is critical and in full bloom in places like Disney. We hope to be able to provide experiences like this to as many athletes as possible in the future. We witness the healing and are honored to be a part of it. Deepest thanks to the incredible crew at Shades of Green for their warmth and hospitality. Our crew would not be complete without Virginia Redmond, Roy Griffith and many of our steadfast volunteers. Thanks to the wonderful Antoinette Darrow and John Hughes for helping make RunDisney operate with efficiency and heart. Thanks to all the Cigna guides who ensured that our athletes had a truly magical Disney experience. And most of all, thanks to the Cigna Foundation; without its support none of this would be possible. On the weekend of January 20th, thirty-one Achilles athletes ran and rolled across the finish line at the Chevron Houston Marathon and Aramco Half Marathon. This is the 5th year the marathon has had a program for Athletes with Disabilities. Achilles has had a record number of participants every year. While there were plenty of Houstonians, Achilles NYC and the Achilles Freedom Team made a few cameo appearances too. There were PRs aplenty (go Mel Blume with a 44 minute PR and Harsh Bhasin with a 38 min PR!). Boston qualifications crushed (12 people qualified!). Way to show up and shine Achilles!! Nearly 100 festive Achilles athletes and guides descended upon Engineer's Gate in Central Park last December for our annual Achilles NYC Reindeer Romp. Runners and walkers were treated to unseasonably warm (and a bit rainy!) conditions as a gaggle of spirited chapter members donned reindeer gear and Santa Hats for the 4-mile trek through Central Park. Others were festooned in Christmas lights and there was even a penguin! Upon crossing the finish line, rompers were treated to hot cocoa, mini donuts and a few home-baked goods courtesy of our dedicated volunteers. A great way to close out 2018! RESERVE YOUR SPOT! It’s that exciting time of the year again! We are preparing for the 2019 TCS New York City Marathon. If you do not get a spot in the drawing, don’t worry! We have a bib for you! Guaranteed. Check out details HERE and let us know if you would like a spot! “Charity Season” for the 2019 TCS New York City Marathon officially begins on February 27th! We would love to have you run with us and raise funds to support our programs. We sold out very fast last year. The Lakin Challenge was a great success for end-of-year donations, being matched one-to-one up to $50,000. We hit our goal and more. Huge thanks to Robert Lakin, Neil Mellon and David Greenstein for their generosity giving us another opportunity to double donations to Achilles. Achilles Freedom Team has been awarded a VA Adaptive Sports Grant. We will be focusing on introducing adaptive running and handcycling to NYC veterans who are wounded, injured, or ill with a goal of become members of our NYC Chapter. Free coaching and adaptive equipment will be provided. We are looking forward to launching clinics at the Manhattan VA and have added new handcycles to our fleet. If you are a veteran in the NYC area who is interested in joining Achilles, please email Janet Patton at Achilles. jpatton@achilesinternational.org or call 212 354-0300. Achilles is proud to be partnering with the National Organization on Disability on their Look Closer campaign. The National Organization on Disability is looking for working Americans with disabilities to share their employment stories. The campaign is a national awareness effort intended to promote Americans with disabilities as a valuable and largely untapped talent pool, with the goal of creating more jobs for our country’s ~57 million people with disabilities. Please help by sharing! Your story is essential to showing that not only can people with disabilities work, they already are. The only requirement is that you are currently working or have worked and identify as a person with a disability. People working in any job type, in any industry, at any level, and with any disability (visible or hidden) are encouraged to participate. Stories will be published in their campaign story gallery and shared on social media. To submit your story online, click here. Achilles International is incredibly thankful for the support from our newest partner, Accessible Dispatch -- a service that allows New Yorkers and visitors to access the city like never before! Accessible Dispatch gives New York City residents and visitors with disabilities greater access to wheelchair accessible taxis. Passengers can request an accessible taxi on-demand for pick-up anywhere in the five boroughs and pay the metered fare, with no extra fees. Visit www.accessibledispatch.com, call 646-599-9999 or 311 (NY Relay: 711), or download the “Accessible Dispatch NYC” app to book your next trip. With Accessible Dispatch, you can access the city like never before! We are pleased to announce our new Tri Team Director, Ben Green. Ben has been a volunteer with Achilles for nearly two years and has helped provide tremendous coaching, leadership and guiding during that time. Ben will be taking on the role of Director replacing Charles Catherine, who will remain as the Captain of the team as he shifts his focus towards his goal of making the Paralympic team for France at the 2020 Tokyo games. More info on the Tri Achilles team can be found here. ACHILLES PIZZA & MOVIE NIGHT! Audio descriptions available. All Achilles athletes, guides, and friends are welcome to join us for a special movie night. Pizza will be served and audio description guides will be available upon request. Doors open at 6:30 and the movie screening will start at 7:15! Movie to be screened will be announced prior to the event! ACHILLES 17TH ANNUAL HOPE & POSSIBILITY® RACE will be on Sunday June 23rd at 9am in Central Park. This is the largest race in the world that embraces people with disabilities. We hope to see you there! ACHILLES 2019 ANNUAL GALA AND AUCTION will be on Wednesday, October 30th at the Union League Club. Congratulations to Bond Caldaro! Bond has been a volunteer with Achilles since 2009 and has completed marathons as well as triathlons with our members. She is also an avid hockey player and watches shows like Granchester and Poldark in her spare time (what spare time, you may well ask?). Thank you so much, Bond, for the amazing things you do for Achilles. We are truly grateful. Achilles Boston has a new home! Saturday 10AM workouts are now meeting at Tracksmith's Trackhouse on Newbury Street in Back Bay. Tracksmith is an independent running apparel brand that celebrates running culture and fosters the personal pursuit of excellence. Tracksmith was founded in Massachusetts in 2014. Last year, they moved from Wellesley to Boston and established a permanent retail store that has become a community hub for runners. Achilles Boston is beyond thrilled to have their support! Please give Tracksmith a shout-out and follow on social media. Their handles are @TracksmithRunning on Instagram and Facebook, and @Tracksmith on Twitter. A quick "thank you" from our international family, reinforces our bonds in this community and shows our strength as a team. Every year for the past 4 years the Achilles Phoenix chapter participates in the 5k and 15k Hot Chocolate race in Scottsdale, Arizona. Nine Chapter Members ran the 5k and 16 members ran the 15k. There was lots of fun eating and drinking chocolate...and running!! February 16th – Achilles 4-Mile “Love Run” - 10 a.m. Central Park @ 90th Street Entrance. No registration required. Just show up!